In small microwavable bowl, microwave chocolate chips uncovered on High 30 to 60 seconds, stirring every 15 seconds, until melted and smooth. Spoon melted chocolate into 1-quart resealable food-storage plastic bag; cut tip from 1 corner of bag. Pipe 8 spider legs onto cooking parchment or wax paper-lined baking sheet. Freeze about 15 minutes. In large bowl, beat cream cheese and icing sugar with electric mixer on medium speed until smooth and creamy. Add pumpkin, pumpkin pie spice and 1 1/3 cups of the Greek yogurt. Beat on medium speed until blended. Pour mixture evenly into 10- to 12-inch wide shallow serving dish. Spoon remaining Greek yogurt into 1-quart resealable food-storage plastic bag; cut tip from 1 corner of bag. 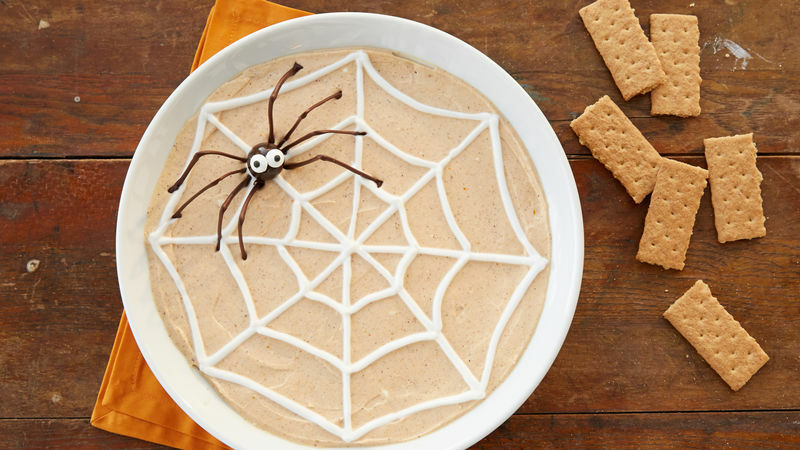 Pipe yogurt to make spiderweb design over top of pumpkin mixture. Serve this dip with sweet and salty dippers – graham crackers, sliced apples and pretzels all are great options. Store leftovers tightly covered in refrigerator.